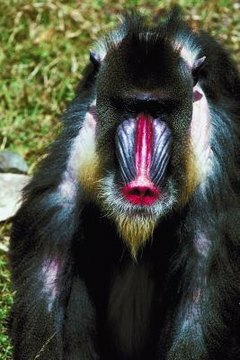 Mandrills (Mandrill sphinx) are a big, timid and very bright species of monkey. These conspicuous animals are notable for their coloration, particularly their red and blue faces. In times of conflict or thrill, these vivid colors turn especially prominent. Mandrills consume omnivorous diets with both plant and meat components. Mandrills are Old World monkeys that are common throughout regions of western Africa, such as southwestern portions of Congo and Cameroon, Equatorial Guinea and western regions of Gabon. These predominantly terrestrial animals live mostly in dense and damp tropical rainforest settings, and also in bush, montane forest and savanna environments. Mandrills are the biggest species of monkey on the planet, according to the Rosamond Gifford Zoo. Mandrills reach full physical maturity somewhere between 4 and 8 years in age, and can live for as long as 40 years. Mandrills are omnivorous animals that eat their fair shares of plants and animal flesh alike. The mandrill diet is extremely diverse in nature. Some common staples of these monkeys' diets are nuts, seeds, bark, herbs, roots, shoots, tubers, foliage, tree bark, crabs, fish, grass, fruit, mollusks, birds and their eggs, fungi, spiders, mice, snakes, tortoises, lizards, worms, frogs, snails and bugs. Mandrills' insect dining preferences include ants. The monkeys also occasionally feed on cultivated agricultural produce. In times of dry weather, mandrills often head to plantations to consume cassava, bananas and oil palm fruit. Mandrills are foragers and utilize their long limbs for tracking down food. Like all Old World monkeys, these guys possess handy cheek pouches for saving and transporting sustenance. Searching for food is generally a male responsibility in the mandrill world. While the male monkeys scour the floors for nourishment, youngsters and females wait in nearby trees. Mandrills that live in captive zoo environments, for example, follow a slightly different diet than those in the wild. Some foods that captive mandrills frequently eat include fresh vegetables and fruits, bark and monkey chow. Some of the fresh vegetable and fruit offerings are apples, iceberg lettuce, romaine lettuce, oranges, potatoes and tomatoes.